Hasegawa Cosmo Sport "1968 Marathon de la Route"
This is a modified version of Hasegawa's very nice street version of the Cosmo L10B (110S) kerbside kit (kit HC-02). The Hasegawa designers did their homework well, since this kit contains not just a new sheet of decals and some additional headlights, but also modified front suspension arms and larger brake discs. 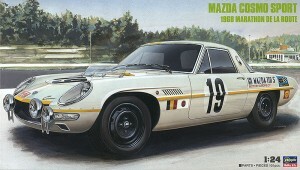 Decals are included for doing either of the two cars entered in this 84hr race at the Nürburgring in August of 1968. Car nr.19, driven by Belgian drivers Dernier, Deprez and Ackermans, finished the race in fourth place, whilst car nr.18, driven by Japanese drivers Koga, Katayama and Katakura, retired from fifth place with a broken rear axle after 82 hours of racing (due to mechanical failure, not driver error). As with the street version, a beautiful set of self-adhesive chrome-like badges is included to add the finishing touch to this kit.